Bubba Kush 33 from CH9 Seeds are feminised cannabis seeds with a delicious powerful taste. This nice weed strain is originated by crossing the Pre-98 Bubba Kush x 98 Aloha White Widow x Jack33. CH 9 Bubba Kush are cannabis plants that are very suitable for growers with less experience because she is very easy to grow, prune and harvest. The tops of these plants are very compact and dense. These cannabis plants are appropriate for an indoor grow and outdoor grow. This weed tastes like hash and is quite peppery. The smell of this plant is very intense. 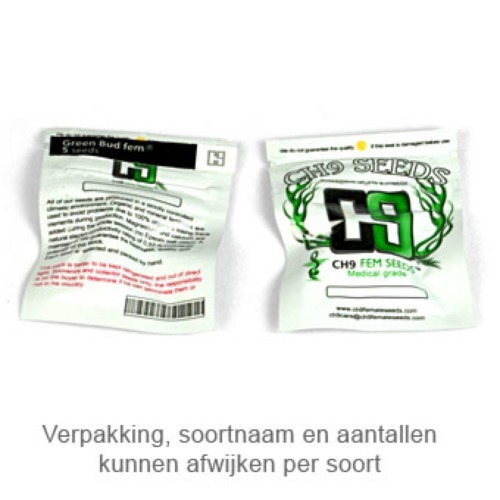 This strain is frequently used as medical cannabis seeds, the exact effect is unfortunately unknown to us. Growing cannabis from these feminised cannabis seeds provide you a weed that is easy to grow and which you can use as medical cannabis seeds. Tell us and our customers what you think of the Bubba Kush 33 from CH9 Seeds.